Etihad Airways, which is seeking regulatory approval for its planned Rs 2,058 crore (Rs 20.58-billion) stake in India's Jet Airways, said on Wednesday that it is awaiting a final approval from the Indian authorities for the deal which could enhance its global reach. Speaking at the 2013 CAPA Australia Pacific Aviation Summit held in Sydney, Abu Dhabi-based Etihad Airline’s President and CEO James Hogan said, "We are delighted to welcome Air Serbia to our equity alliance, and look forward to receiving final approvals from regulators in India of our investment in Jet Airways," he added. The Abu Dhabi-based airline last week bought 49 per cent stake in Serbia's national airline Air Serbia and a five-year management contract to run it. "Including Jet Airways, where we’re still going through the regulatory process, Etihad Airways will have six equity and 46 codeshare partners, offering a pool of over 96 million guests and a choice of more than 410 destinations on six continents, serviced by a fleet of approximately 500 modern aircraft," said Hogan. The Etihad-Jet deal is awaiting nod from the Foreign Investment Promotion Board after which it needs approval of the Indian Cabinet. 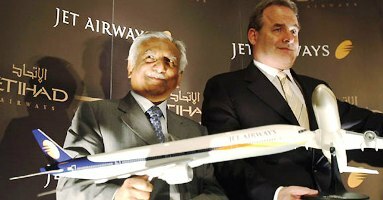 "Etihad Airways has applied for investment to a stake of 24 per cent in the equity of Jet Airways. The investment is within the ambit of FDI policy on aviation sector," Minister of State for Civil Aviation KC Venugopal said on Tuesday.